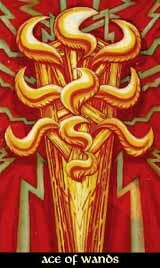 Like all Aces, the Ace of Wands symbolizes the roots and the entity of its element, here it is the root of Fire, the first spark to create the flaming powers of Atziluth, the world of the all-encompassing spiritual substance. Being the essence of Fire, the Ace itself goes nowhere, but stands for the strong feeling that soon might turn into a strong will or plan. There is a spiritual power that has the ability to grow, it is completely up to us wether we use it or not. The Ace of Wands might turn out to be bad when we cannot control or use its power that starts burning all out of a sudden, and all its riches get burned down before we can use them for good.